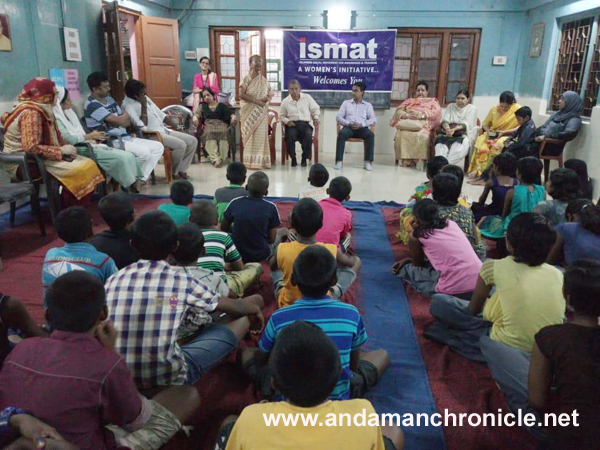 Port Blair, Sept. 10: As part of the Eid celebration ISMAT a women’s initiative, an NGO working in the field of children and women organized a celebration with the inmates of Seva Niketan at Dairy Farm. The chief guest for the occasion, Dr. Mrs Poonam Arora greeted the gathering with Eid Mubarak and applauded the efforts of ISMAT team. Mr. Yunus, Sub Divisional Officer, BSNL spoke on the topic why Eid is celebrated. The Ex Chairperson Smt. Shanta Laxman Singh and President Gandhi global family Mrs. Anuradha Lal spoke on the topic ‘Living in Harmony’. The President and Secretary Rotary club of Port Blair, Shri Rajesh Anand and Shri Dinesh Akt were also present. Earlier the President Ismat, Smti.Shanaz Jadwet welcomed the gathering.